Dana Dartez Klein was born in the French Jewish settled community of Kaplan, La. She teaches Biblical Hebrew of which she is writing a Biblical Hebrew grammar. She has two published books. One titled, " The Doctrine of Original Sin"and also "True Biblical Prayer, An Analytical Study". She is Dean of Jewish Studies and the vice-president of Apostolic Theological Seminary. She has an M.Div. and has studied Biblical Hebrew at Hebrew University, Jerusalem. Currently she is full-time student at LSU. She teaches Old Testament studies from the original language. Enroll and learn the grammar and syntax of the Bible in it's original language - Hebrew. Her motto is this: "If you are using only a Strong's concordance, you are weak in the Word. Studying the Holy Bible in its original languages of Hebrew, Aramaic and Greek will give you an understanding of the Word of God that is worth more than silver and gold". Telephone: 337-285-6045 or 337-517-3954 or fill out an interest form on this website. ​along with your books and the $50 Hebrew tutoring fee. This course is an expository course outlining the teachings of Judaism across the various denominational lines. This is not a course to induct the student into Judaism. It is an educational course. You will learn all about Judaism, and learn to compare and analyze practices that are Biblical and simply tradition. We cover the Jewish Life Cycle Events within this course. with an emphasis in Semitic Languages. This course outlines the entire course of Jewish History from Genesis to today. We cover the highlights of Jewish history including Holocaust studies and a chance to incorporate outside studies also to further your knowledge. You may after taking this course decide to Minor in Jewish History or Holocaust Studies. That will be available Fall 2018.
and current forms of usage within today's religions etc. From the Tabernacle in the wilderness to the Temple and the Priesthood. This course gives the student a solid biblical teaching along with the Jewish perspective. This equips you to teach and understand the significance of the Tabernacle, Temple, Priesthood and it's types. This is much more than a Bible College student would receive. It is geared for the advanced student.This course has lots of detail about Jewish and Christian understanding of the subject matter. This is the study of Judaism during the time Jesus walked the earth. This study includes a textbook along with assigned readings.It covers also the different things going on in Rabbinic Judaism of that time period. We study all forms of Jewish prayer, and analyze how things are done across the Jewish denominations, and compare and contrast them with Christianity. Pre-requisite is Hebrew 1. We discuss Tefilim and various interesting including origins of common practices within Jewish synagogues today. This is a very requested course, and will not only help you understand many things within the New Testament, but you will recognize the components of prayer that continue on today.We will not be teaching nor performing non Biblical practices except for demonstration purposes. We study each Biblical and Non-Biblical Holy day in-depth along with practices done and those currently being celebrated. We also study the Jewish Calendar and the concepts of sacred time and space. We also discuss the various differences in the past and present celebrations of both along with what is truly Biblical in practice in contrast with tradition. You will write papers, and a final essay for this class on the Holy Day of your choosing. Be prepared to enjoy each lesson/lecture, and share your knowledge with your family and church. If you are interested we also do Jesus in the Passover Seminars at churches. Just call the office to book one for our congregation. This course covers the important ancient texts that comprise the teachings of Judaism, and studies them in-depth. It also includes the study of Biblical manuscripts used to comprise the Holy Bible, their origin and make up and components. Discussed also is the relevance of the dead sea scrolls and a basic knowledge of orthography. 10. 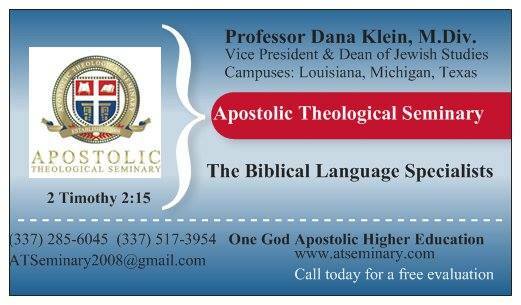 Old Testament Biblical Aramaic Language Studies, Dr. Bruce Klein 4 credits $300. This course covers the Aramaic language interspersed throughout the Old Testament with multiple chapters of Aramaic in Daniel and Ezra. It is in-depth. Pre-requisite Biblical Hebrew. The language and practice of Jewish Law both moral and ethics. This course also covers Jewish law in regards to Women. ​There is a required book list to purchase that will be given to you upon enrollment. Biblical language classes are required along with Hebrew reading with Professor Natanya Hayles, and Professor Sheila Whitlock by webinar. They are Professor Dana Klein's assistant professors and both possess Masters Degrees from Apostolic Theological Seminary in this field of study and are also tutors. When you have completed this program you will be more proficient in teaching within these areas. This knowledge will greatly aid in your ministry. We have a web based learning site you will be required to work in along with the opportunities to be in a classroom situation from any place on the globe that you have internet access. I have taught my students while studying and living in Israel for a month at a time. When you complete this program you will receive a degree in Jewish Studies, and a certificate in Biblical Hebrew as well as Aramaic. If you so decide you can also minor in Semitic Languages, or a dual degree in Theology as the core concentrations transfer within the program. Sincerely I hope you will study with us and grow in your knowledge of Jewish Studies. We have based this program on the same components as the first Jewish Studies Program in America with an emphasis on solid Apostolic Doctrine that so many are losing today when interested in Judaism. If you are interested in including a trip to Israel please consider a group setting with people from your church. We take study groups from Churches to Israel. Your Hebrew knowledge and things you learn in this Major will enable you to really appreciate your trip to the Holy Land. We go and stay within the Jewish Quarter and experience what it is like to walk in the places Jesus walked in. You will be forever changed by that experience if you have not traveled there yet. It would be wonderful if you could come with us during or after you complete your program. We rent a van and go out as a group to really experience Israel from the Northern Golan Heights to Mt. Arbel , to the ancient Fort of Masada, to the Southern city of Eilat where you can see the Reed Sea at the border of Egypt. Our past trip in 2017 included a trip to the Knesset. You will not feel awkward as you will be seeing what you have learned going on right before your very eyes. Shabbos Tov from Professor Dana Dartez Klein, M.Div. Dean of Jewish Studies.